Have you seen the Taylor Swift UPS delivery trucks lately? Now you could win concert tickets and a prize pack delivered by UPS when you pre-order Taylor Swift’s new album, reputation, at UPS.com/TaylorSwift. It’s the UPS Taylor Swift Concert Flyaway Sweepstakes. The UPS Taylor Swift Concert Flyaway Sweepstakes is open only to legal residents of one of the 50 United States (including the District of Columbia) who are at least 18 years old (or age of consent) at the time of entry. The Sweepstakes begins on August 25, 2017 at 7:00 AM ET and ends on November 17, 2017 at 11:59:59 PM ET. 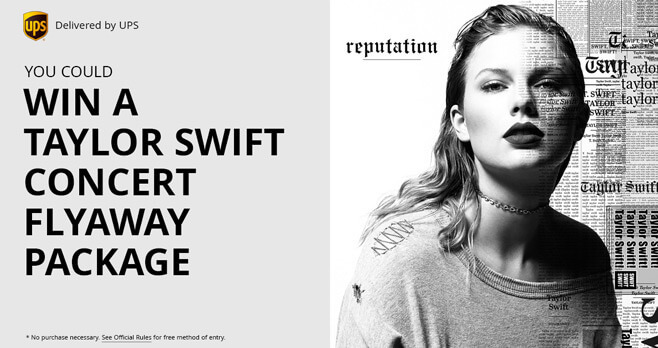 During the Sweepstakes Period, visit The Taylor Swift Official Store through the UPS website at taylorswift.ups.com and purchase “reputation CD + Exclusive Photos”. You will then be prompted to check the Sweepstakes entry box and agree to the Official Rules. Upon making a Qualifying Purchase and checking the box, you will receive one entry into the Sweepstakes. Regardless of the method of entry, there is a limit of 10 entries per person during the entire Sweepstakes Period. Administrator will randomly select the potential winners from all eligible entries received in the applicable Drawing Period. There will be a total of 1 potential grand prize winner, 5 potential first prize winners (1 per Random Drawing Date), and 220 potential second prize winners (22 per Random Drawing Date). Grand Prize (1 total): The grand prize is a trip for 4 to a Taylor Swift concert event. Grand Prize includes round trip coach class airfare for up to four (4) people between the major commercial airport closet to winner’s residence, and a major city airport in the Event location; two (2) nights in a hotel selected by Sponsor in its sole discretion (2 rooms, double occupancy); four (4) tickets to the Event; four (4) vouchers for a makeover for winner and each guest; dinner for four (4) awarded as a $1,000 gift card; four (4) keepsake boxes; four (4) short sleeve shirts; four (4) hoodies; four (4) patches set; four (4) hats; four (4) copies of “reputation” and four (4) custom shadow boxes that feature signed video memorabilia. The ARV of the Grand Prize is $12,700. First Prizes (5 total, 1 per Drawing Date): The first prize is two (2) tickets to a Taylor Swift concert event; one (1) keepsake box; one (1) short sleeve shirt; one (1) hoodie; and one (1) hat. The ARV of each First Prize is $645. Second Prizes (220 total, 22 per Random Drawing Date): There are two (2) second prizes available. The first available Second Prize is one (1) custom shadow box. There will be one hundred ten (110) custom shadow boxes available eleven (11) per Random Drawing Date. The ARV of each custom shadow box is $300. The second available Second Prize is a swag bag that includes one (1) bag; one (1) Bluetooth speakers; one (1) water bottle; one (1) hoodie; and one (1) short sleeve shirt. There will be one hundred ten (110) swag bags available, eleven (11) per Random Drawing Date. The ARV of each prize pack is $151. The total ARV of all prizes is $65,535.00. For a list of winners, interested individuals should mail a self-addressed stamped business envelope to: Winners List, – UPS Concert Flyaway Sweepstakes, P.O. Box 251328, West Bloomfield, MI 48325. Winner List requests must be received no later than January 16, 2018. I have never received my Cd?